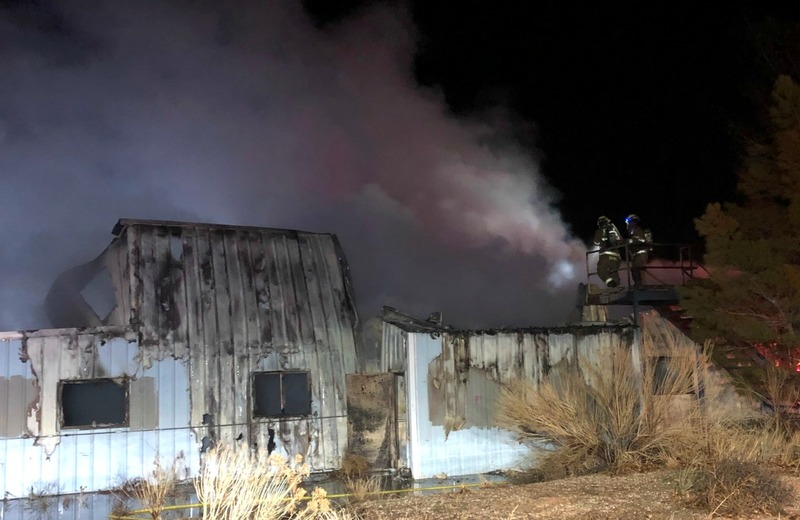 ST. GEORGE — A reported brush fire Tuesday night turned out to be a structure fire that ignited in an old abandoned warehouse off Old Apex Mine Road. The blaze brought more than 20 firefighters and – because of the location – thousands of gallons of water as well to the scene. At 7:35 p.m. firefighters were dispatched to what was initially reported as a brush fire in a remote area east of Old Highway 91 on Old Apex Mine Road approximately 10 miles southwest of Ivins, Santa Clara/Ivins Fire Chief Randy Hancey said. Instead of a brush fire, crews arrived to find an old abandoned building completely engulfed in flames. 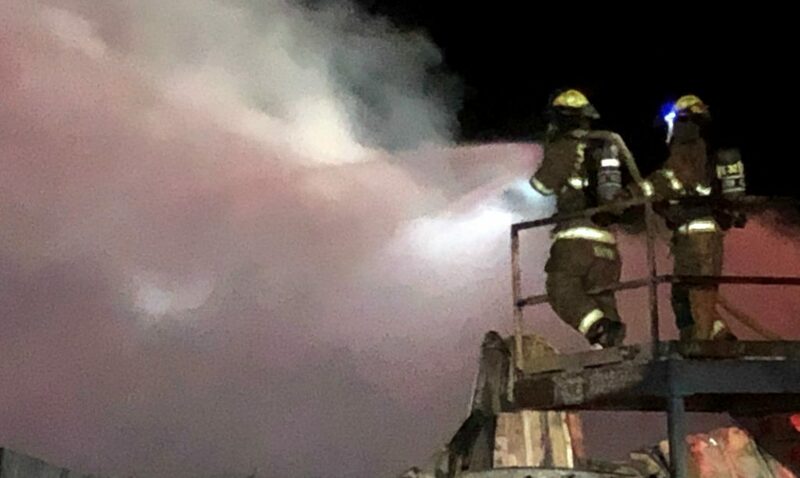 “There were a few fire hydrants situated near the structure, but none with the level of water pressure needed for firefighting efforts,” Hancey added. Fire teams staged on several sides of the building and began a defensive attack from outside of the structure, a tactic which is initiated when the structure is unsafe or fire conditions prevent an interior attack, and were able to extinguish the blaze, Steve Ikuta, public information officer for Santa Clara/Ivins Fire and Rescue said. 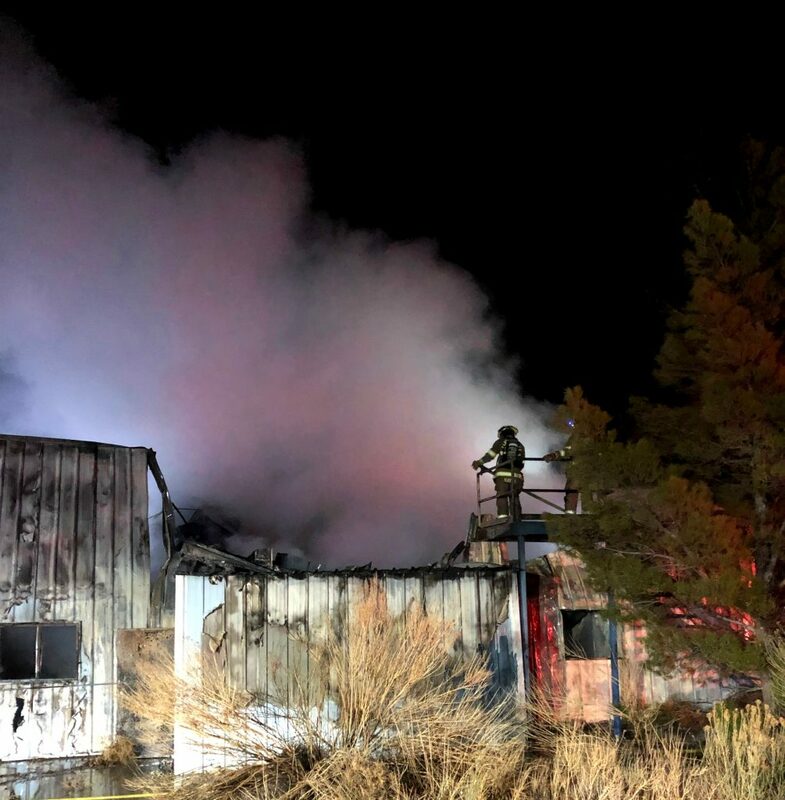 Crews began the overhaul process and continued checking for embers or hot spots that could reignite at a later time, efforts that continued throughout the night and into Wednesday. 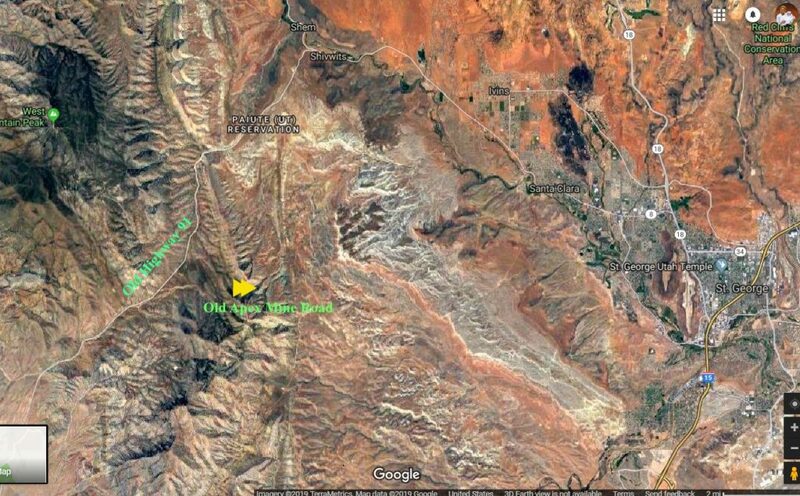 “They are still out there working now,” Hancey told St. George News Wednesday morning. 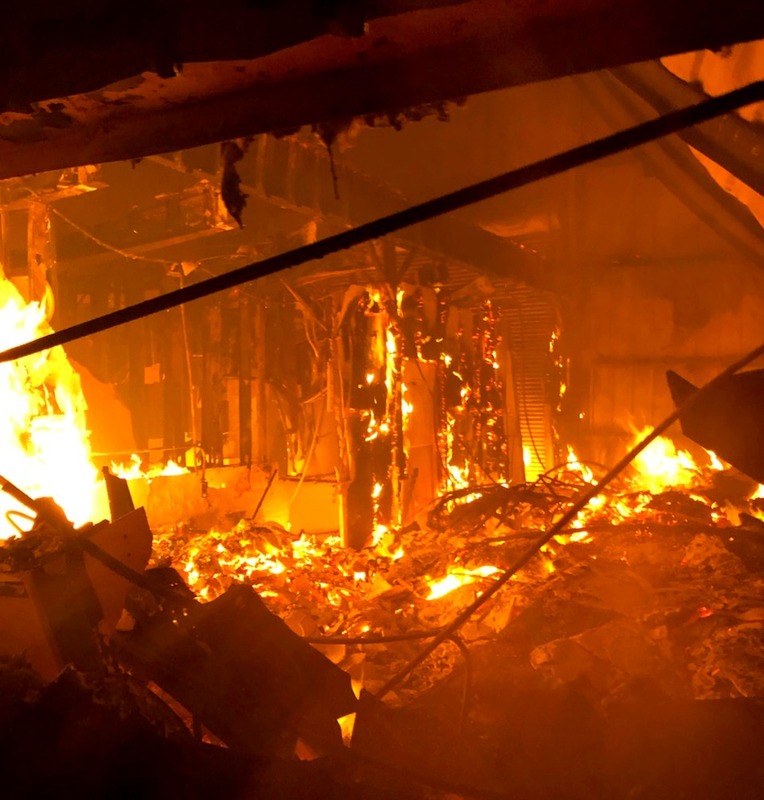 The structure was a complete loss, and while the official cause is undetermined, Hancey said there is no electricity at or near the abandoned building where the fire started, and they fought the fire in heavy rain, which rules out any weather-related cause. “Officially it’s undetermined, but more than likely it was human-caused,” he said. The fire was reported by a motorist driving on Old Highway 91 who called 911 to report a brush fire after observing smoke and a bright glow coming from the area. “We got it as a brush fire because there was no way for the motorist to know it was actually a building on fire from where they were on Old Highway 91,” Hancey said. 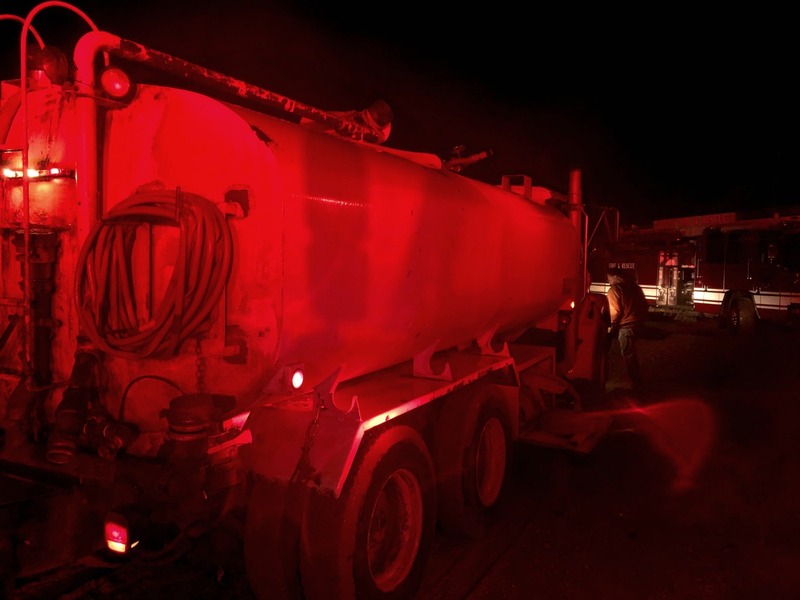 Firefighting efforts required more than 2,000 gallons of water from the fire department’s tanker, 4,400 gallons from a tanker provided by Kayenta Development, and water from a large water storage tank located nearby. “Luckily we were able to tap into that large water storage tank, because we went through the water we had in both tenders pretty quickly,” Hancey said. Santa Clara Ivins Fire and Rescue and the Washington County Sheriff’s Office responded and tended to the scene. No injuries were reported. Third possibility: lightning. That’s consistent with the timing (in a rainstorm). I drove by this building a few months ago and it was pretty dilapidated. So the fourth possibility: insurance fraud. That building wasn’t going to be of use to the owners anytime soon as it was. I’d like to think its a longshot, but it does happen. If it’s your building then yes bulldoze it. If it isn’t, it ain’t done yet.